The Aggies spent less than a minute scoring three of their six touchdowns and beat New Mexico 61-19 on Saturday at Maverik Stadium. The Aggies started their swift play with 1:25 left in the first quarter. In 27 seconds, Utah State went 72 yards in three plays. Sophomore quarterback Jordan Love threw 32- and 28-yard passes to senior wide receivers Aaren Vaughns and Ron’quavion Tarver for a 28-3 USU lead. Love’s passing to start the second quarter led to another quick Aggies touchdown. On third-and-9, Love completed a 40-yard pass to senior wide receiver Jalen Greene for the conversion. His 29-yard throw found sophomore tight end Carson Terrell in the end zone, giving USU a 35-3 lead in 54 seconds. It took the Aggies a little more time to nab their next touchdown, but they still got it done in 59 seconds. Love threw a 55-yard pass to junior running back Darwin Thompson on third-and-10 that brought Utah State into the red zone. Love’s subsequent 19-yard touchdown pass to junior tight end Dax Raymond put USU up 42-3 with 11:33 remaining in the first half. The Aggies now have 17 touchdown drives that have lasted under one minute. Love dominated the game from the start. He went 23 of 34 and amassed 448 passing yards for four touchdowns. The 448 yards was the fourth-most in a single game by an Aggies quarterback. Utah State also exhibited how suffocating its defense can be. The Aggies forced four consecutive three-and-outs by the Lobos in a stretch that bridged the first and second quarters, and the Aggies scored after each of those stops. Love said the Aggies felt in a groove after about the second or third consecutive touchdown. USU senior linebacker Suli Tamaivena pointed to one defensive play in particular that set the tone for the Aggies. 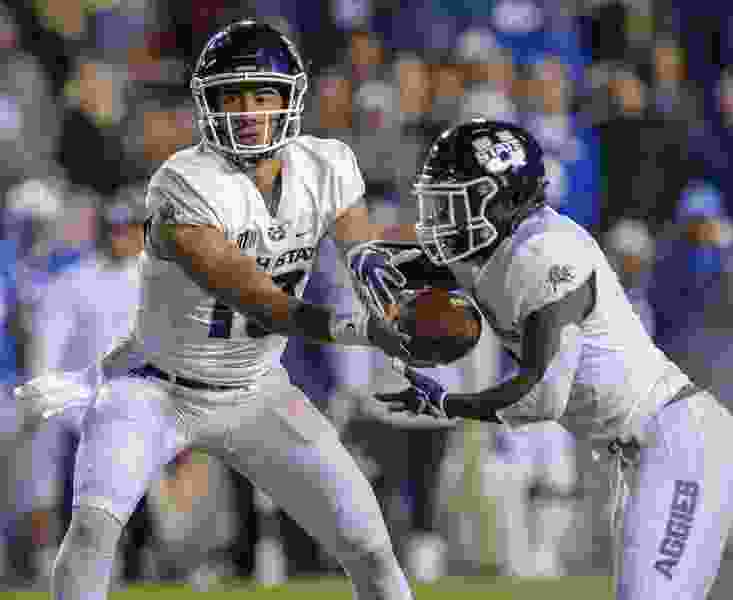 It happened in the first quarter, when sophomore safety Shaq Bond got in the passing lane and intercepted a pass that was sure to be a touchdown for New Mexico. Bond ran the entire length of field, slowing down only to change direction and get behind his blockers, for a touchdown. The play gave the Aggies a 14-3 lead with 6:33 left in the opening frame. New Mexico didn’t score its first touchdown until 10 minutes remaining in the third quarter. Utah State tallied a school-record 704 yards of total offense to UNM’s 291. Utah State scored 28 points in the first quarter, its most in an opening quarter since 1991. … DJ Williams made his first career interception in the third quarter. … Kevin Meitzenheimer picked up his first career interception in the third quarter. … Tarver and Greene had 112 and 108 receiving yards, respectively. It was the first time USU had two receivers with over 100 yards since 2012. • Utah State scores a season-high 52 points in the first half. • Six players score a touchdown for the Aggies. • First time in school history that the Aggies tallied over 700 yards of total offense. Correction: 1:15 a.m.: An earlier version misstated that the class of Jordan Love. He is a sophomore.